...an ATC. I haven't made one for ages, but I was playing around making layered tissue paper backgrounds for some cards, and some off-cut oddments turned out to be just the right size. 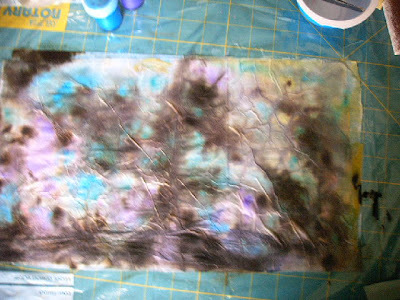 The background is made by first laying down a sheet of polythene, then a layer of white tissue, squirting this with acrylic floor sealer and some water based paint in various colours, another sheet of tissue, a topping of polythene, then going over the sandwich with a brayer to spread everything around and merge the colours. My next step, while this was still wet, was to remove the top polythene sheet, add another layer of tissue, then coat the whole surface with floor sealer again, as this is what gives the paper its stability when it is dry. 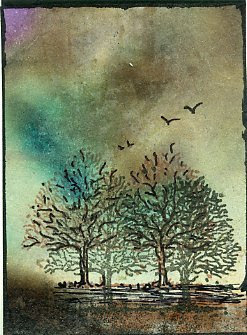 I left this layer quite crinkly to add a little texture, then used a dropper to add brown writing ink that crept along the wrinkles and spread out into the paper, fading gently as it went. I left the whole thing to dry overnight. When it is dry, you have a choice of using the matt crinkly top surface, or the shiny smooth surface that has dried against the bottom polythene layer. I did take a quick photo part way through the process, but as you can see, it is out of focus, badly exposed, and the wet surface is reflecting too much light, but you get the general idea. . ....I love your ATC, Totty - you're so clever using all those different techniques, well done. WOW, what a fabulous technique. That atc is beyond words gorgeous!! Ooohhh the atc is gorgeous! !